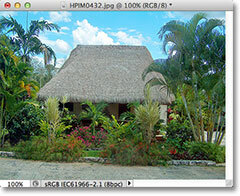 Resizing an image is one of the most commonly used skills in all of Photoshop. It's so common, in fact, that even people who know virtually nothing about Photoshop still manage to use it to resize their images, which should give you an idea of how easy it is to do. In this tutorial, we'll learn how to resize images, as well as a general rule to keep in mind so your resized photos remain crisp and sharp. I'll be using Photoshop CS5 here but the steps are the same with any recent version of the program. Go to Image > Image Size. 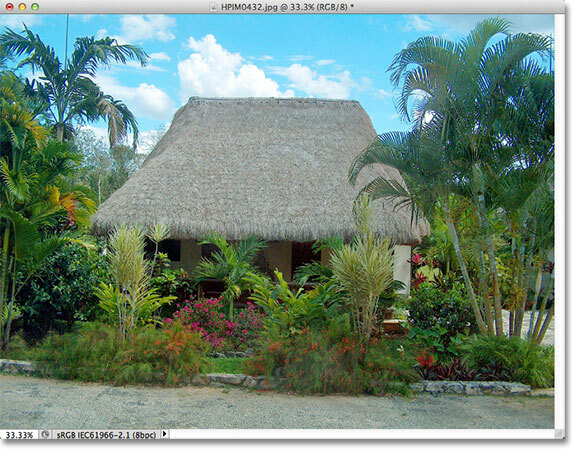 The Image Size dialog box. This screenshot of the Image Size dialog box was taken immediately after I opened the original photo, before I resized it to a smaller version for displaying on the page. If you look closely, you'll notice that the dialog box is divided into two main sections - Pixel Dimensions and Document Size - each showing different measurements. Since this tutorial is all about how to resize an image, we only need to concern ourselves with the top section, Pixel Dimensions, since it's the one that controls the actual, physical dimensions (in pixels) of the photo. The current file size is displayed to the right of the words "Pixel Dimensions". The current width and height of the image, in pixels. Entering new Width and Height values for the image. To change the Width and Height values, simply double-click inside one of the two boxes (either Width or Height), which will highlight the number currently showing in the box, and then type a new value. When you're done, click the OK button and Photoshop will resize your image to the new dimensions you've specified. Changing the measurement type from pixels to percent. Once you've chosen percent as your measurement type, the Pixel Dimensions section will display the width and height of your image as a percentage rather than a pixel value. Resizing the image using a percentage is done the same way as if you were using pixel values. Just double-click inside the Width or Height value box and type in a new percentage. When you're done, click the OK button and Photoshop will resize the image to whatever percent value you entered. This icon tells us that the Width and Height values are currently linked together. The Constrain Proportions option keeps the aspect ratio intact but can be disabled if needed. Resizing images in Photoshop may be easy, but there's something very important to keep in mind when it comes to maintaining image quality. In general, it's okay to make a photo smaller than its original size, but you want to avoid making it larger whenever possible. Let's look at an example. Reducing the size of the image. The image after resizing the width and height by 50 percent. Changing the Width and Height values to 200 percent. The image after increasing its size by 200 percent. By enlarging the image, I've managed to return it to its original size, but when we compare the quality with that of the original, the enlarged version clearly doesn't look as good. We've lost a lot of detail in the image, and it's starting to look soft and blurry. If I was to enlarge it even further, the image quality would grow progressively worse. Here's why. When you use the Image Size command to make a photo smaller, Photoshop makes it smaller essentially by throwing away pixels. It just takes some of the pixels from the image and tosses them out the virtual window. Fortunately, Photoshop is really good at knowing which pixels to throw away without sacrificing image quality, so making our images smaller isn't usually a problem. The problem comes in when we ask Photoshop to make our images larger. If Photoshop makes them smaller by tossing pixels away, how do you think it makes them larger? If you answered, "By adding pixels to the image", you'd be right! But here's the bigger question. Where does Photoshop get these new pixels from that it's adding to the image? If you answered, "Um, I'm not sure. I guess it just kind of makes them up out of thin air", you'd be right again! And therein lies the problem. When Photoshop makes an image larger, it has to add pixels that were not there before, and since Photoshop wasn't on the scene when you took the photo, it has no idea what a larger, more detailed version of the image should actually look like, which means it has to guess. Of course, Photoshop is a very powerful program and its guesses are based on some very complicated and advanced math, but at the end of the day, it's still just a guess, and it's not going to guess correctly. Bottom line, the larger you try to make your image, the worse your image is going to look. Instead of the sharp, highly detailed version you were hoping for, you'll get something that looks dull, soft and blurry. So again, when resizing your image, it's okay to make your images smaller, but you should avoid making them larger at all cost unless you absolutely don't care about image quality. And really, who doesn't care about image quality? That's just nonsense.